Winter lays snow on hills rising over pagoda roofs. Summer colours local fields barley-gold. All year round spring water bubbles in the glen. As alive as that day in 1886 when our founder William laid the first stones that built one of the oldest family-owned Scotch whisky distilleries. Join us at Glenfiddich, in the Valley of the Deer. The valley William so carefully chose, the century-old traditions, and the warmest of welcomes remain unchanged to this day. 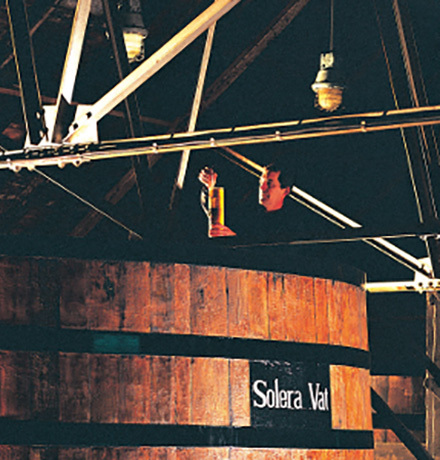 When you visit, you’ll discover tall copper tuns, great wooden washbacks and stone-walled warehouses filled with earthy, aged aromas. We are proud to be one of the last independent distilleries in Scotland, with the freedom to maintain our tradition of innovation with a pioneering spirit. 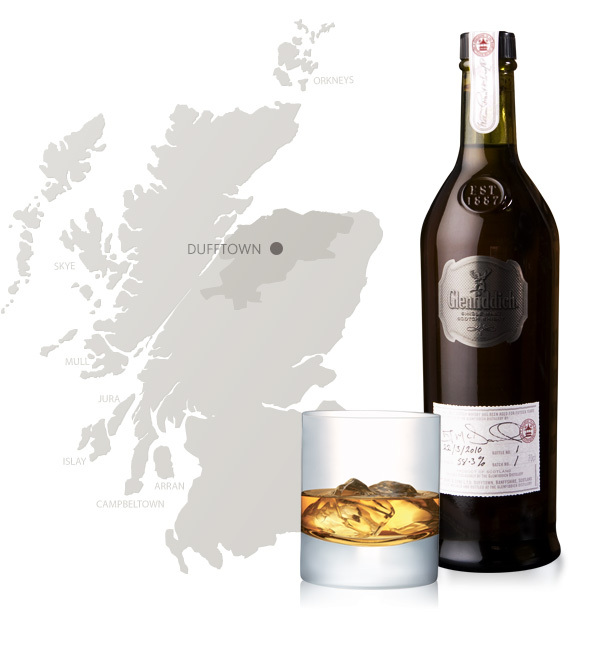 We're just half a mile (0.8km) north of Dufftown, where our founder William was born. Our guides are a wealth of knowledge and they're multilingual. So please let us know if you'd like your tour in a specific language and we'll do our best to accommodate you. If you would like to visit our online shop, please click here. On this tour, you’ll go on a journey through every part of the Glenfiddich tradition, to find out how the world’s most awarded whiskies are created. Your visit will begin with a short film recounting our five generations of family ownership. It’ll then be followed by an on-foot tour of the distillery with the chance to see how our whiskies are created by craftsmen with generations of understanding. The tour includes a visit to the still house where you can see how our stillmen capture the sweetest part of our distillate from our unusually sized copper stills. 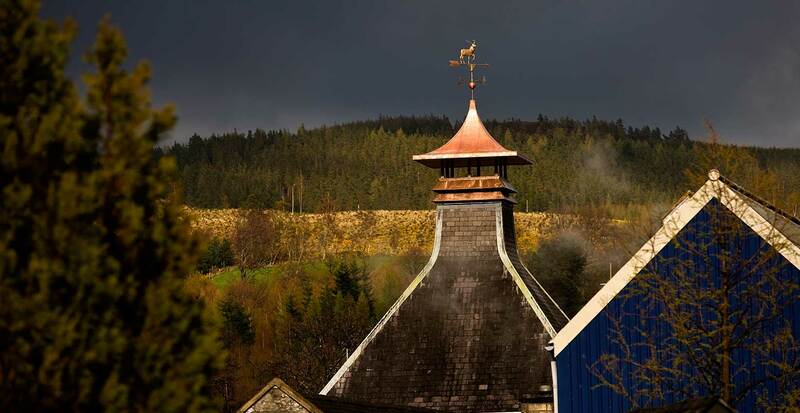 Time matters when whisky making. So, as well as touring the distillery, you’ll visit our original warehouse where you will explore the generations of gently maturing casks. You’ll also learn how we achieve depth and consistency of flavour throughout our range of exceptional whiskies. The special conclusion to this visit is a tutored nosing and tasting of three of our world-renowned single malts. Under 18s are welcome on this tour but must be accompanied by an adult. Daily between 10am and 4pm. 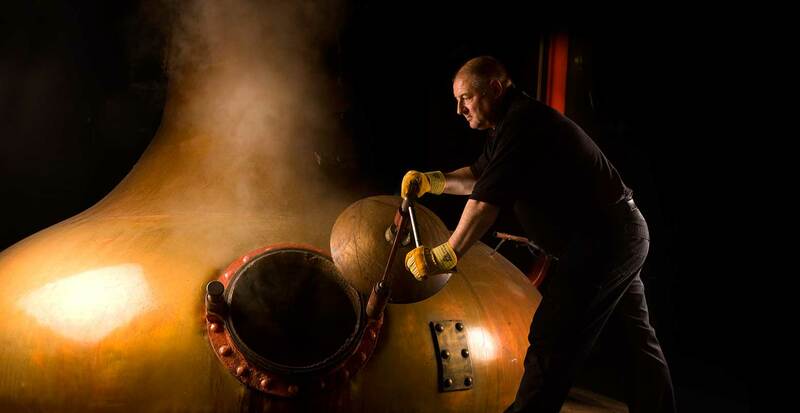 Discover how our carefully selected casks develop flavour and character over the years. Following an introductory film, your guide will take you through each step in the whisky making process. 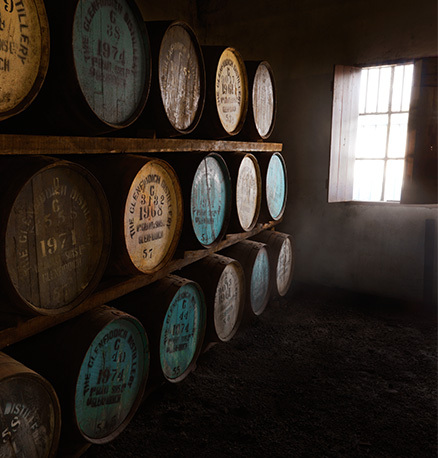 Discover how our carefully selected casks develop flavour and character over the years, by visiting warehouse 1 and warehouse 8, home to our most innovative and experimental releases. 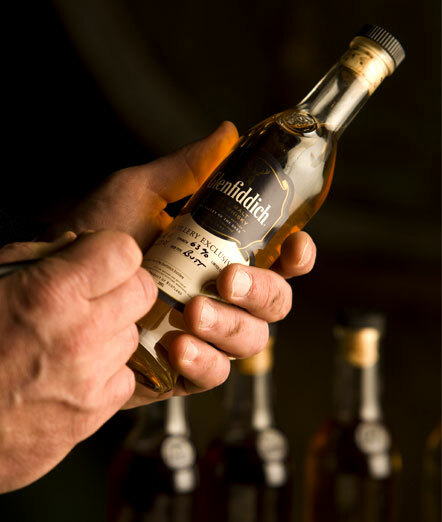 After visiting our bottling hall this tour will conclude with a private tasting of 5 Glenfiddich Single Malts. You must be over 18 to take part in this Glenfiddich tour. Daily at 11am, 1pm & 3pm. Matured for 15 years, Glenfiddich Solera is one of our most distinctive whiskies. As such, we’ve developed this specialist tour to give you an insight into how we create one of the world’s most unforgettable single malts. Following your distillery tour visit warehouse 8, home to our unique Solera process. You'll discover what makes our 15 year old such an exceptional dram. You’ll then be taken into our malt masters blending room: here you will enjoy tasting a number of cask-strength samples. You’ll also have the unique chance to step into our Malt Master Brian Kinsman’s role, preparing your very own version of Glenfiddich 15 year old by combining different cask samples together. Each guest will be able to bottle a small sample of their own creation to keep. We can only welcome a maximum of 8 guests on each tour and therefore we ask that you reserve places in advance to avoid disappointment. Daily at 10am & 2pm. 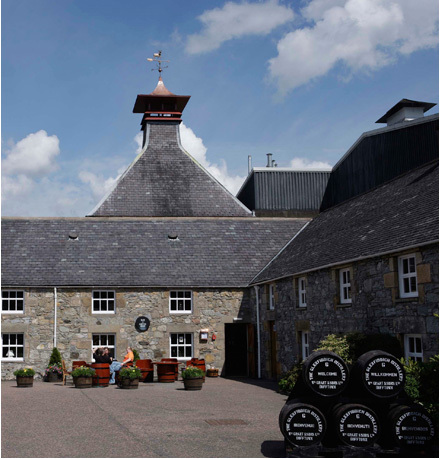 Join us for an inspiring half-day visit to the home of the world's most awarded single malt. After being welcomed by one of our experienced guides, you’ll experience the wealth of craftsmanship and traditions that are still used at the distillery today. You’ll have the chance to learn how we balance these with the innovation that has allowed us to create a range of exceptional whiskies. During the course of your tour, you’ll visit a number of warehouses and discover warehouse number 12, home to the Malt Master’s Selection. This range of 4 casks has been specially chosen by our sixth Malt Master, Brian Kinsman. Here, you will be invited to fill a 20cl bottle from the cask of your choice, which you will be able to take home, along with a beautiful commemorative book documenting your trip to the distillery. We will conclude the experience with a tutored masterclass of a selection of five of our finest whiskies along with delicious canapés prepared by Addy Daggart, our head chef. This tour needs to be booked at least a week in advance and is for over 18s only. The maximum group size is eight people. A Speyside secret turned famous by our award-winning chef Addy Daggert. If he’s not working on another innovative recipe, he’ll be serving up seasonal food on a menu that changes each week. Giving you the very best local ingredients. Sit by an open fire, take in the view and have a generous share of warming Scottish fare, from coffees, cakes and light dishes to tasty bistro lunches and inspired evening serves. Our menu looks after all your dietary needs. Open 7 days a week, all year round. In the heart of our Distillery, our historic barley store is now renovated and set with granite walls and a solid oak bar. Taste Glenfiddich whiskies from an unrivalled selection of 12 to 50 Year Old single malts, vintage reserves and rare whiskies no longer in production – the largest range of Glenfiddich pouring whiskies in the world. The Malt Barn Bar is the only place where you can try our Malt Barn collection. You can taste something you may never experience again – our 1958 whisky selling for £1000 a dram. Or a more affordable 2003 expression for £15. Whichever you decide on, each is expertly selected by our Malt Master Brian Kinsman. The Malt Barn Bar offers a unique range of Whisky Flights offering a fantastic way to taste a number of our whiskies alongside each other. The bar has a varied selection to suit everyone from the novice whisky drinker to the experienced taster. Monday to Sunday 9.30am - 4.30pm. This summer, our gift shop has undergone a dramatic transformation. Restyled and updated with classic and contemporary furniture, it is now home to a selection of stylish luxury lifestyle products including clothing, accessories, homeware along with our full range of Glenfiddich whiskies and exclusive distillery bottles. The new product lines feature items primarily from Scotland. The gift shop will also include a section devoted to our online Glenfiddich Gallery which enables enthusiasts to browse online and select a bottle from our most precious and rarest casks. Take the opportunity to bottle a cask strength 15 Year Old. Create a personalised label for a 12, 14 and 15 Year Old. 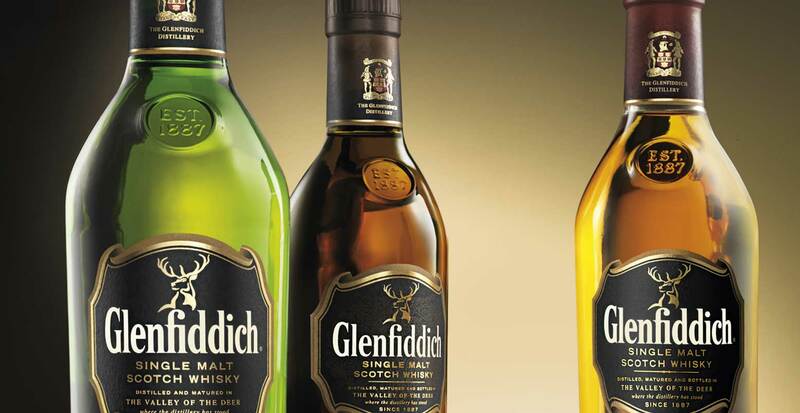 Buy rare Glenfiddich single malt Scotch whiskies, many only available here. We’ve been involved in some exciting collaborations, to bring you something original you can take away with you. The finest Scottish cashmere knitwear and accessories by Johnston of Elgin. Beautiful hand blown decanters and glasses by Glasstorm. Traditional hip flasks and drinking accessories by Wentworth Pewter. All these and more for you to take away as a lasting memory of your visit to the home of Glenfiddich. We’ve been involved in some exciting collaborations, to bring you something original you can take away with you. The finest Scottish cashmere knitwear and accessories by Johnston of Elgin. Beautiful hand blown decanters and glasses by Glasstorm. Traditional hip flasks and drinking accessories by Wentworth Pewter. All these and more for you to take away as a lasting memory of your visit to the home of Glenfiddich.We’ve been involved in some exciting collaborations, to bring you something original you can take away with you. The finest Scottish cashmere knitwear and accessories by Johnston of Elgin. Beautiful hand blown decanters and glasses by Glasstorm. Traditional hip flasks and drinking accessories by Wentworth Pewter. All these and more for you to take away as a lasting memory of your visit to the home of Glenfiddich. As recently as the 1960s people outside Scotland were only used to drinking blended whisky. We were so proud of our single malt, that in 1963 we introduced it to the world and created the single malt category. Whisky’s tourism industry started right here at our Distillery. 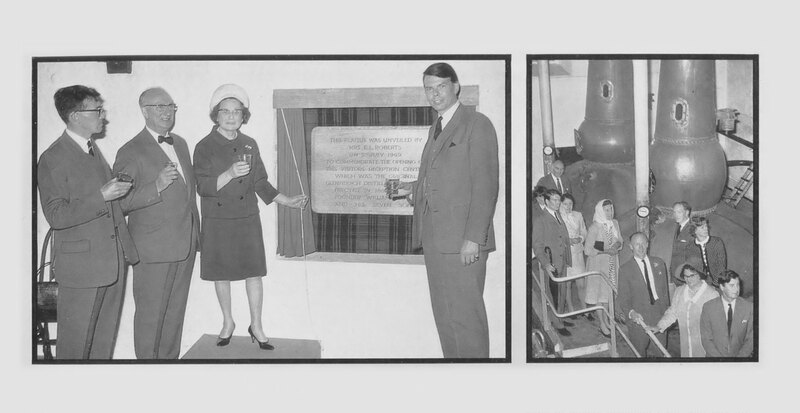 Janet Sheed Roberts, our founder’s last grandchild, opened our Distillery doors with the first visitor centre in 1969. Our whisky-making process hasn’t changed since 1887. We use the same water source, the same unusually shaped stills, and the same high cut point to capture the heart of our distillate. Traditions all laid down by our founder William Grant. To guarantee absolute quality and authenticity. The towering rooftops of one of our oldest buildings, the Malt Barn, were built with stones our founder William carried from the bed of the River Fiddich. 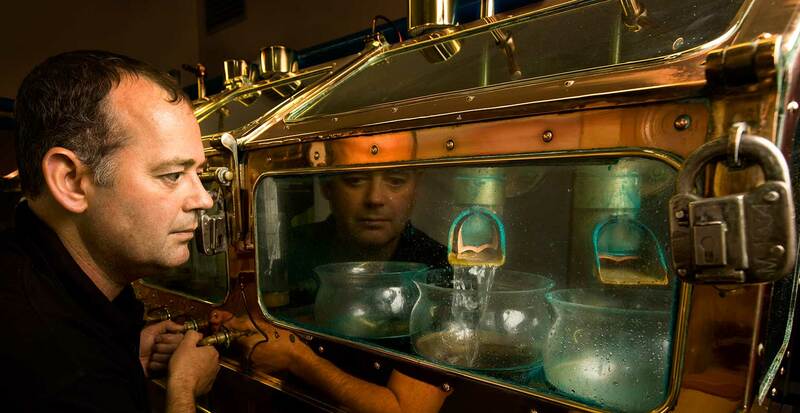 We are the only distillery in Scotland to use a single source of water throughout the entire whisky-making process. We use the pure waters of the Robbie Dhu spring, its unique highland tang wrought from millennia of flowing though Banffshire peat and over Scottish granite. We boil Juniper bushes in all our new stills, a local tradition forgotten by many distilleries. Juniper neutralises the natural sulphur in barley and cleanses the copper until it is ‘sweet’. Specially sourced malted barley, water from the Robbie Dhu spring and fermentation in traditional pine washbacks, all carefully come together to create the fruity notes that define our single malts.